When a little one turns two, it is time of discovering a surrounding world and, of course, to have fun together with parents. During this second year of life, your toddler learns lots of things and enjoys activities. Every day, two-year-old learns new skills. And this is the era when he or she tries to find balance by exploring life. Pulping, moving, singing, and imagining — we sure, both of you already love all of that. Choosing a gift for two-year-old can be a kind of challenge. This process requires to use all your creativity to buy toys or come up with entertainment that your little one will really enjoy. Moreover, it is always an excellent idea to find a gift for 2 years old that takes focus on education. To know what toys and games are suitable for two-year-old, it is an essential part of understanding the milestones achieved by your child and choosing the toys that take off his or her developing. Here we have already found some selections for engagement learning, exciting playing, and spent fun time together. “I can do it myself” — is the thing, that gives satisfaction and pleasant moments for kids of all ages. Especially, this case is useful for toddlers, who have already entered the era of some independence. Thus, is always a good idea to give them educational toys, that support kid’s skills and help them in self-developing. The Learn to Tie a Shoe by the manufacturer Melissa & Doug is precisely such kind of toy. 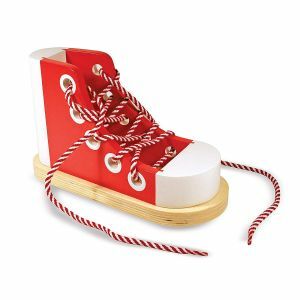 This toy is designed in the shape of the high-top sneaker that heavy enough to stay in place on any horizontal surface. The toy also has a big size, shoelaces, and holes, that are suitable for little kid’s fingers. Due to bright colors and ergonomic shape, this toy gives the toddler both an enjoyable and beneficial time of play and practice his motor skills. 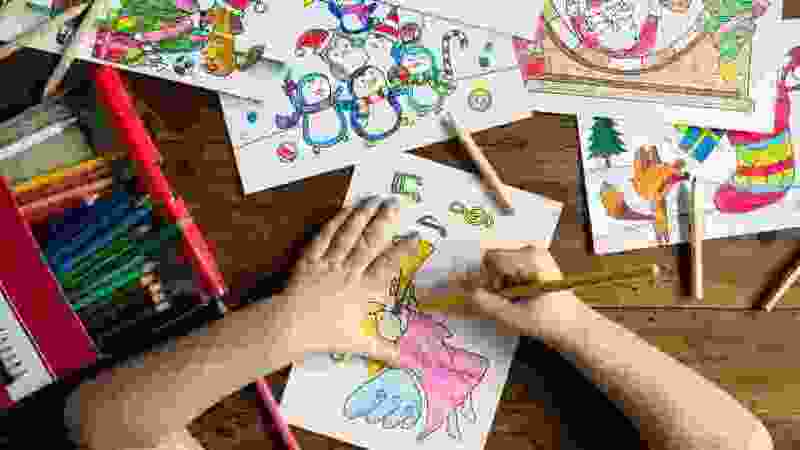 If your little budding artist starts to experiment with paints and colors, try to focus his attention on multi-functional canvas by manufacturer Step2. 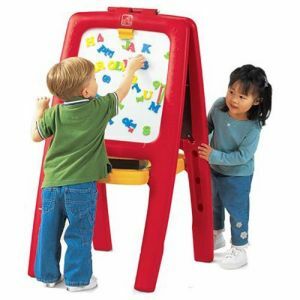 We sure, the 2 years old child will enjoy to play and study via Easel with Magnetic Letters and Numbers. The design of this product includes a deep tray for your pencils, erasers, brushes, chalk, and other supplies that promote exciting entertainment. Also, there are two sides for artwork. So, you loved toddler can use the easel together with friends. One area is suitable for chalk drawing. The other, magnetic surface, is the perfect item for words compilation and study numbers when your little one will grow up to 3 years and older. The white side also can be used with erasable markers. Each side of Easel with Magnetic Letters and Numbers by Step2 is completed with the holder with a clip for a paper. The manufacturer proposes two colors of this item (pink or red) with a different amount of numbers and foam letters (77 pieces or 94 pieces). The Easel for Two with Magnetic Letters and Numbers by Step2 is the flexible product, that is able to interest your child even he or she will be older. Due to small pieces, the letters and numbers are not recommended for two years olds. Nevertheless, when your kid overcome the milestone of 3 years, the magnetic board will be the joyful part of the studying process. The kids are the little adults. Especially two years olds toddlers: they absorb habits of their parents like sponges and want to be like adults with all their might. So, toys like real parent’s stuff can be the perfect gifts for little ones. The Brew & Serve Coffee Set by Melissa & Doug is an excellent toy to encourage the imagination of two-years-olds. We sure, your kids or other little members of your family, will have an enjoyable time. Due to this realistic-looking set for coffee making, the toddler will feel yourself like the father or other ‘big person.’ This pretend-play coffee maker is made of durable wood. It includes big pieces of stuff to sure that little kid can’t gulp it. 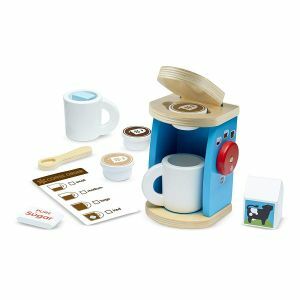 The Brew & Serve Coffee Set includes two mugs (for playing with a friend), three coffee pods, pure sugar, the pack with cream, the spoon, an ice cube. The Brew & Serve Coffee Set by Melissa & Doug offers the numbers of ways to have fun and study. This set includes the card with the menu and ideas for activity. Use this manual as a springboard for exciting entertainment and easy skill-building. The information in the menu helps your little wonder with word recognition, boosts his or her storytelling skills. The Pounding Bench Wooden Toy by Hape is the godsend for parents of a too much curious and hyperactive child. The product provides free of a tantrum, calm hours for a mother and a father, and joyful time for a toddler. This multifunctional toy promotes both playing and studying time. 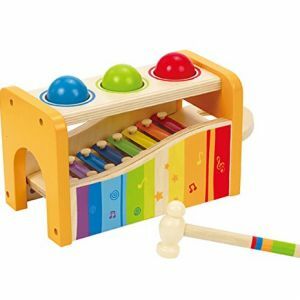 Thanks to the design with pounding panch in the top and xylophone in the lower level, your two-year-old kid will explore various sounds, improve motor skills and even strengthen muscles. The product also pumps coordination, tiches to solve problems, boosts logic, matching skill, and sense of beauty. The Pounding Bench Wooden Toy by Hape is suitable for little ones ages 12 months to 3 years. This toy is an excellent intro in the world of wondrous music. It provides different ways for exploration. Let your kid drops the balls on the keys. Or let the toddler pulls out the xylophone, takes the wooden hammer, and creates his or her own tunes. Thanks to the well-polished exterior, round corners, and firm material, this toy offers safe playtime with pounding and tapping for the years. The Rock and Ride Rocking Horse by Labebe is able to make beneficial entertainment for your child. The back and forth movement of this rocking horse is an excellent way to make your child soothe and calm. This toy moves like a mother with a newborn in her arms and brings warm memories in kid’s mind. This gift choice for two years old provides coordination skills via calm swing and natural balancing. Also, we sure, that your toddler will enjoy the galloping ride option. 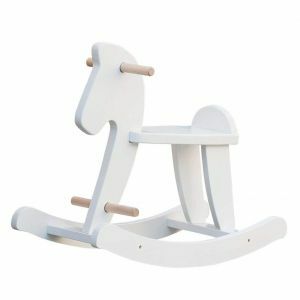 Thanks to the design with high-quality wood, Rock and Ride Rocking Horse gives your kid hours of enjoyable and safe galloping. Therefore, it allows developing all toddler’s skills that help to grow healthy. Your little ones will learn how to move via their own strength. Also, the Rocking Horse contributes to the power of kid’s independence, because it does not require help from adults. The horse is lightweight thus suitable for movement from one apartment to another. It is also clear to use and is suitable for toddlers ages ten months to 3 years. If you are looking for a gift for a toddler that will be both beneficial and enjoyable, the Hape Snail Sorter is the adorable idea. This little friend can follow your kid during a walk in the park, or gives the company for activities at home. 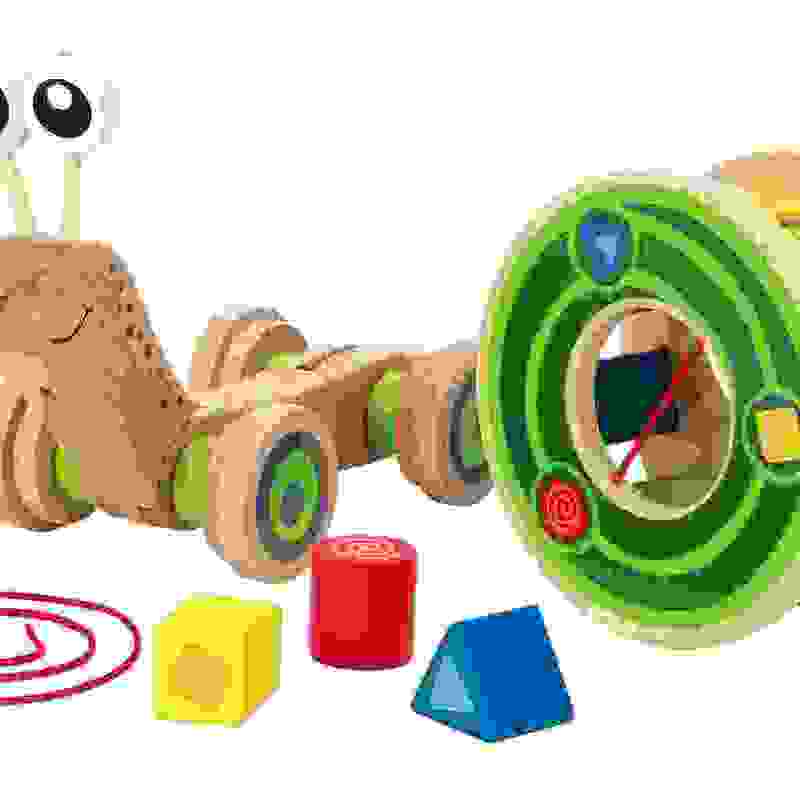 Choose Snail Sorter to support your little one’s skills of solve-problem and motility. Hape Snail Sorter is the toy that promotes two ways of entertainment. Due to the design, it can be used as the tagalong pull & drag toy or the shape sorter. The toy also has big wheels for easy movement, wobbly head, cute eyes, and shaky tail. The comfortable pull cord is long enough that your kid can easily pull the toy behind his back during the walk. The snail sorter by Hape can move along without its shell, or with the empty shell without blocks. The Hape Snail Sorter is the multi-tasking toy that teaches a kid to distinguish colors and shapes. The design of this product is completed with the shell with wooden blocks. The sorter is removable and can be used as the separate toy. There are three variously holes and the corresponding shapes: triangle, cylinder, square. All of them has different colors: blue, red, yellow. The opposite side of this sorter is completed with the elastic-banded hole for easy access to the shapes. Discover the extremely large pack of building toy by Mega Bloks. This gift idea is perfectly suitable for lovers of hands-on creation. And we know, the 2 years olds toddlers are precisely such kind of persons. Make no doubt, the Mega Bloks Big Building Bag will make a wow-effect for your little ones. This entertainment set includes 80 colorful blocks with different shapes. The blocks perfect fit in small hands and are varied enough to bring to life the imagination of your toddler. Kids of all ages will interest in stacking, building and rebuilding again and again. From skyscrapers and castles to boats and cars, there are no borders of creativity. 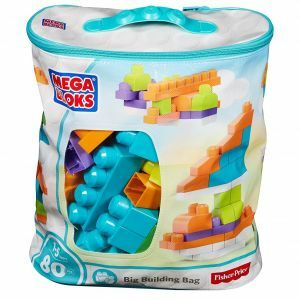 Mega Bloks Big Building Bag offers enjoyable moments both for kids and their parents. If you are worried about mess after playtime, the manufacturer has already taken care of that. The entire set of blocks comes in the environmental-friendly holder. So, just zip them up to the bag until the next time. If you are sure that avoiding noise from children is unbelievable tusk, give your little ones a tool that makes uproar enjoyable for you! And do it easily via Musical Instrument Set by Boxiki kids. This educational kit is about the rhythm and nature of music. No doubt, it will inspire your 2 years old daughter or son to learn the language, singing and playing. The set includes the different types of instruments for drumming and percussion. Each of them is created for little hands and helps your kid to make their own sound. Let’s begin the wondrous music session via Musical Instrument Set by Boxiki kids. 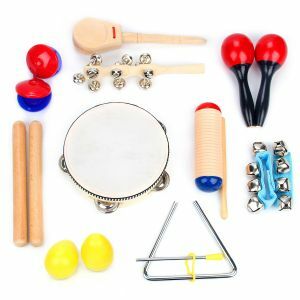 This kit includes everything your little one needs to start the journey to the world of music. There are the shaka-shaka eggs (set of 2), the maracas (set of 2), the large sleigh bell, the wrist bells (set of 2), the triangle with the striker, the sounder, the finger castanets (set of 2) and the handle castanet, the claves (set of 2) and the tambourine. All tools are made with safe for child materials such as wood and stainless steel. Is next top musician or sport-lover growing in your family? 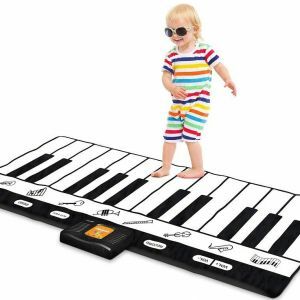 Do not make a choice of entertainments for your kids via Keyboard Playmat by manufacturer Play22. This gigantic play area is suitable both for physical exercises and sounds learning. Due to the sensitive surface, the electronic mat plays by your kid’s hands or feet touch. The Keyboard Playmat comes with the 24 touch sensory keys. Each of them offers the sounds of 8 musical instruments. Your little ones can choose from instruments such as piano, clarinet, guitar, saxophone, trumpet, xylophone, violin, and banjo. The images with all equipment will help for that. Moreover, this device has 4 modes to play, record, playback, and set the demo option. It also supports the volume control and the automatic power off feature. Are you on the hunt for smth pleasant for the toddler in your life? We have already done it for you! More playing and comfort — that is provided by our gift idea for two years old kids. No doubt, the Fishing Game Bath Toy by the manufacturer Fajiabao makes the bathtime for your little one like the next exciting game. The Fishing Game Bath Toy is the selection for the parents with cranky toddlers. 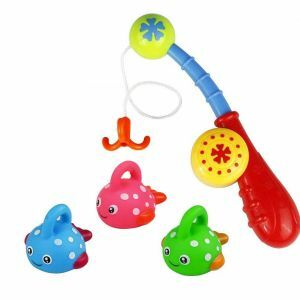 If a tantrum is a familiar guest of their bathtime, the toys like the Fishing Game are the solution. This item is absolutely exciting for kids, even for young antagonists of a bath and a shower. The toy comes with a fishing rod and a realistic, safe for kids, hook. The catch of your little fisher consists of three fish with different colors. We know, the two-years-old wonders currently create a tug-of-war for their parents. During the second year of life, the toddlers need both independence, and help from adults. So, introduce your little one to a wide variety of colorful and interesting education toys, and entertainment games that will grab surely his or her attention. We hope, here, you have already found the ideas that will guide in the right direction the bursting energy and curiosity of your loved 2 years old kids.